Hurricane Michael made landfall on the Florida Panhandle as an extremely dangerous Category 4 storm with maximum sustained winds reaching 155 mph. Michael is the most intense hurricane to make landfall on the Florida Panhandle, and the strongest to strike the US in the month of October, bringing catastrophic wind and storm surge to the region. After cutting a destructive path through Florida and Georgia, Michael barreled into North Carolina where it weakened into a tropical storm. It subsequently moved out to sea. At least 26 deaths have been linked to the hurricane. The deaths include a Florida man who was killed by a falling tree that crashed into his home and an 11-year-old girl in southwest Georgia. The National Weather Service warned some locations may be uninhabitable for weeks or months after the devastating storm. Mandatory evacuations were in place in at least 13 Florida counties, and another six were under voluntary evacuation. The Florida State Emergency Operations Center said that the number of deaths in the state has more than doubled to 16, bringing the total to 26 deaths across four states that can be attributed to Hurricane Michael. Twelve of those deaths occurred in Bay County, where the eye of the hurricane made landfall, leaving beach communities like Mexico Beach and Panama City in despair. Two deaths occurred in Gadsden County, while Gulf County and Clay County had one death each, according to their respective county coroners. Outside Florida, six people died In Virginia, three deaths were reported in North Carolina, and one person died in Georgia. President Donald Trump arrived in Georgia late Monday afternoon to continue his tour of areas devastated by Hurricane Michael. At a Red Cross briefing on storm damage in the city of Macon, the president said that he had just left Florida, and that "the people there are thrilled with our people and our talent — what they were not thrilled with was this hurricane." In response to a question from reporters about climate change, Trump said that storms have appeared to be getting worse in recent years. "There is something there, man-made or not," he said. "For a long period of time, we’ve had very few [storms]. I have a home in Palm Beach, Florida. And frankly, for years we had none, and then the last couple of years we had more," Trump continued. "Hopefully we’ll go back to many years of having none. We’ve been hit by the weather. There is no doubt about it." When asked about the damage to stealth bombers that had to be abandoned after Michael hit Florida's Tyndall Air Force Base, Trump said that although the storm had come faster than predicted, the damage at the base was not as extensive as originally reported. President Trump and first lady Melania Trump met with residents affected by Hurricane Michael and handed out bottled water at a FEMA distribution center in Lynn Haven, Florida. "To see this, personally, it's very tough. Very, very tough. Total devastation," he said. Trump and the first lady, accompanied by Florida Gov. Rick Scott and Department of Homeland Security Secretary Kirstjen Nielsen, surveyed a street of damaged homes and spoke with homeowners. Among those he talked to was Michael Rollins, who stayed during the storm because he could not evacuate with his pet parrot. "You just saw Michael, who actually was about the only person in this area that rode it out. He said he's never been so scared in his life. He’s never seen power like this, trees coming down left and right." Trump praised the mayor of Lynn Haven, Margo Anderson, for convincing people to leave the area even as the city hall building collapsed around her and her staff. The town has reported no casualties from the storm. Anderson told the president that when Michael hit the town, "It was the equivalent of a 40-mile-wide EF-3 tornado for 55 minutes." "That's what it seems like to me," Trump said. "It seemed almost like a giant tornado, a really wide tornado, which is incredible." After looking over the street, the president and company went to a nearby FEMA distribution center, where Trump and the first lady handed out water bottles to residents. "These are some of the people that make it work, and they have made it work beautifully," he said at the center. "You’ve seen the job they’ve done. Everybody has been incredible. FEMA and first responders, everybody. Law enforcement. It’s incredible, with the power of this storm." Earlier, the president took a helicopter tour over some of the affected areas and saw sights that he said were "hard to believe." "I've seen pictures, but it's hard to believe," he said. "When you're above it, in a plane, and to see the total devastation, to see no houses left. Not even the pads are left. It's incredible." President Donald Trump and first lady Melania Trump arrived at Eglin Air Force Base in western Florida shortly before noon to begin a tour of areas damaged by Hurricane Michael. The White House has yet to release specific details of the locations the president will visit, but has said that Trump will also tour hurricane-devastated areas in Georgia today. The Trumps were met on the tarmac by Florida Gov. Rick Scott, who thanked the president for his assistance in the state's hurricane recovery effort. "Everything we ask for, they gave,” he said. The president responded by saying the governor was doing "an incredible job." Before boarding a helicopter to survey the damage, Trump told reporters that the government's priority was providing food, power, and safety to victims, some of whom had their houses swept off their foundations by the storm. "You wouldn’t even know they had homes," he said. At least 46 people were still listed as missing in Mexico Beach Sunday as rescue crews continue to comb through the hurricane-ravaged coastal town. Mayor Al Cathey told ABC News that at some point prior to Hurricane Michael's landfall Wednesday, 289 people, including 10 children, told law enforcement they had decided to ignore evacuation orders and ride out the massive storm at home. Forty-six of those residents who stayed behind are still unaccounted for, Cathey said. Touring Mexico Beach and other hard-hit towns in Florida's Panhandle Sunday, the head of the Federal Emergency Management Agency, Brock Long, called the area "ground zero" for Hurricane Michael's devastation. The disaster — which wiped out about 75% of homes and businesses in Mexico Beach — was among the worst he's ever seen, Long said. US President Donald Trump bolstered federal disaster assistance to Florida Sunday, expanding an earlier emergency declaration to cover 100% of debris removal costs for a five-day period. Trump plans to visit Florida and Georgia Monday to survey the damage caused by the storm. The death toll from Hurricane Michael continued to rise this weekend as rescue crews expanded efforts to search for survivors — and bodies — in communities decimated by the storm. Florida Gov. Rick Scott said late Saturday that rescue teams had been combing through the rubble of Mexico Beach, a city of about 1,000 people along the Florida Panhandle that was effectively wiped out when Michael hit as a Category 4 storm Wednesday. In Florida, about 1,700 search and rescue personnel have checked 25,000 homes, Scott said, combing through the debris in communities like Mexico Beach. More than 1,800 law enforcement officers, along with 400 ambulances and 700 emergency personnel, have been sent to the Panhandle and other areas hit hardest by the storm, Scott told reporters late Saturday. The Florida National Guard has also sent about 4,000 troops to assist in the search and rescue efforts, start clearing roads, and bring much-needed supplies to the area. On Friday, authorities announced that they had found one victim amid the wreckage in Mexico Beach, bringing the storm's death toll in Florida to eight. And officials said the death toll is almost certain to rise as emergency crews begin to reach areas initially cut off by the storm's devastating impact. Altogether, at least 18 people have died in connection to Michael, including three people in North Carolina and one person, an 11-year-old girl, in Georgia. In Virginia, the state emergency management agency said Saturday that it had confirmed that a sixth person there had died in connection to the storm. In the Panhandle, officials said that it is difficult to know how many people remain unaccounted for, given the widespread power and cell service outages. Statewide, Scott said, 243,513 people were still without power as of Saturday night. Thousands of calls have come in to emergency centers, officials said, from people trying to locate loved ones who may have decided to ride out the storm in the coastal towns that Michael wiped off the map. As the search and rescue efforts expand, however, word from survivors has slowly begun to reach the outside world. 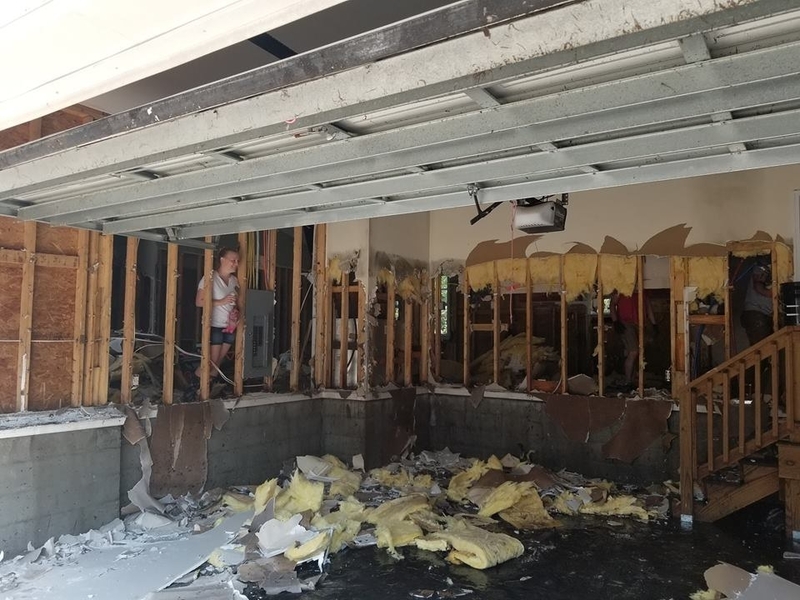 It wasn't until Saturday morning that Dawnn Hicks finally got word that her parents, Nancy and Larry Britt, survived the hurricane after not evacuating from their home in Mexico Beach. Hicks, 53, of Monroe, Georgia, told BuzzFeed News the couple was found safe in their log cabin right off the beach, one of only several structures left standing after the storm tore through the town. “God’s too good to me,” Hicks said. MEXICO BEACH, Florida — As residents returned to Port St. Joe and Mexico Beach, the ground zero Florida Panhandle towns where Hurricane Michael made landfall as a dangerous Category 4 storm Wednesday, they arrived to a landscape ravaged by 155 mph winds and massive storm surge. Warren made the trip two days after the hurricane made landfall — killing at least 14 people as it plowed through the region — from her home in southwest Georgia to check on her own ancestral home in Mexico Beach, an area nearly obliterated by Michael. Located about 30 miles inland from where Michael made landfall as a powerful Category 4 hurricane, Gulf Correctional Institution was not evacuated ahead of the record-setting storm. Instead, the Wewahitchka, Florida, facility took in inmates from at least one of the state’s six evacuated facilities, according to multiple family members of inmates. Since Michael’s devastating landfall Wednesday, official information about what happened has been limited and communication lines at the Gulf Correctional Institution and the overseeing state agency, Florida Department of Corrections, have been down. The head of the Federal Emergency Management Agency (FEMA) criticized Florida residents Friday for not evacuating in advance of Hurricane Michael, which made landfall this week as the region’s most powerful storm on record. “A lot of people don’t pay attention to anything we say or do when it’s a blue-sky day and nothing’s happening,” FEMA Administrator Brock Long said at the press conference. He also called for higher standards for local building codes, an overhaul of the National Flood Insurance Program, and for people to not succumb to “hurricane amnesia” and forget the damage Michael caused. Read more of Long’s remarks here. A 70-year-old man and a 64-year-old woman were killed in North Carolina Thursday night after their car crashed into a tree that fell onto the road during the storm, bringing the total death toll for Hurricane Michael to 14. North Carolina Emergency Management spokesperson Keith Acree told BuzzFeed News the accident occurred around 7:30 p.m. in Marion, a city located in the foothills of the Blue Ridge Mountains. "It was a tree that fell across the road, and then the car was driving down the road and hit the tree," Acree said. One of the victims was pronounced dead at the scene, while the other later died at a local hospital, Acree said. President Donald Trump said on Twitter Friday that he plans to visit both Florida and Georgia early next week after Hurricane Michael tore through the two states. "People have no idea how hard Hurricane Michael has hit the great state of Georgia," Trump said. "We are working very hard on every area and every state that was hit — we are with you!" Satellite images show rows of flattened buildings, boats strewn along the land, and roadways buried in sand in the aftermath of Hurricane Michael on the Florida Panhandle. The images, taken by National Oceanic and Atmospheric Association satellites, reveal the full scope of the damage in Mexico Beach, a small coastal town about 40 miles from where Michael made landfall, which has seen some of the storm’s worst destruction. Take a look at the images here. Five people died in Virginia and a second person died in Georgia after Hurricane Michael swept through the state on Thursday, officials said, bringing the total death toll for the storm to 12 people. Four of the deaths in Virginia were due to drowning, while a firefighter with Hanover County Fire-EMS was killed in a motor vehicle accident. Lt. Brad Clark was responding to another motor vehicle crash on highway I-295, according to a department Facebook post, when a tractor trailer struck the fire engine, injuring three firefighters. Clark died of his injuries at the scene. The tractor trailer driver was also injured in the crash, and needed to be “extricated from the cab of the truck,” according to the Facebook post. The driver and the two other firefighters involved in the crash were transported from the scene with serious injuries. There was also a second death in Georgia, according a spokesperson from the Georgia Emergency Management Agency. Further information was not immediately available. A helicopter dropped off drinking water at a psychiatric hospital in Florida Thursday after debris from Hurricane Michael left many roads in and out of the facility blocked for hours. David Frady, a spokesperson for the Florida Department of Children and Families, said a large tree fell over and broke an underground water line. Drinking water was delivered by helicopter to the Chattahoochee hospital “in an abundance of caution,” Frady said, adding that trucks were able to reach the facility by the afternoon to drop off additional supplies. The hospital’s roughly 950 residents and 650 employees were not injured during the storm, according to state officials. The facility was relying on emergency power generators and staff were using emergency radios to remain in contact with first responders due to service outages in the region. Elsewhere in the Florida Panhandle, US Coast Guard crews had rescued around 40 people and assisted 232 others, including 142 people who were evacuated from a Panama City nursing home, as of Thursday evening, officials said. With astonishingly strong winds, the near–Category 5 hurricane transformed the quaint beachside community's homes and hotels into ragged frames and foundations. In bird's-eye footage, boats look like they were haphazardly picked up and dropped atop palm trees, and entire chunks of neighborhoods have vanished, their remains cluttered along the glassy canal. Florida Gov. Rick Scott said Thursday evening the biggest issue first responders are facing as they engage in search and rescue efforts is a lack of communication in the wake of Hurricane Michael. Scott told reporters after touring the destruction in the Florida Panhandle that not only was the emergency operations center without power but their phone lines were down. "Law enforcement didn't have any communication," Scott said. "Everything was down." He said the state was working with AT&T to get some communication lines open. Verizon reported earlier in the day that it was experiencing service interruptions in some areas. The state has set up an online page where people can file missing persons and wellness check reports while communication lines are down. Officials in North Carolina and Florida have confirmed four additional storm-related deaths, bringing the total number of fatalities from Hurricane Michael to six. A 38-year-old man was killed when a tree fell on his vehicle while he was driving on Mocksville Highway east of Statesville, North Carolina, Kent Greene, director of Iredell County Fire Services and Emergency Management, told BuzzFeed News. Gadsden County officials, who reported the first fatality of the storm Wednesday evening, said on Facebook Thursday that they have confirmed three additional storm-related deaths in the Florida Panhandle following Michael's landfall. No additional information about those three fatalities was released. Trump: "We have not seen destruction like that in a long time"
President Trump said Hurricane Michael was "unbelievably destructive and powerful" as it tore through parts of Florida, but praised emergency officials for their efforts in responding to the monster storm. "The one good thing we can say ... is that it was the fastest hurricane anybody has seen. It was speedy. If it wasn't, there would be absolutely nothing left," he told reporters in the Oval Office. "It was incredibly powerful." The president also mentioned North and South Carolina, as well as Georgia, where Michael passed over and brought large amounts of wind and rain just weeks after those states were hit by Hurricane Florence. He said residents in those states were prepared for the tough times that lay ahead. "They are incredible people and they know how to do it," he said. "They have done it before and they will do it again." He praised electric companies for working to restore power and said FEMA had won "rave reviews" for its handling of the disaster. "We have not seen destruction like that in a long time," he said. Trump also defended his decision to appear at a political rally in Pennsylvania last night despite the ongoing natural disaster. "I wasn't going to disappoint thousands and thousands of people who had been standing in line," he said. Hurricane damage in Panama City, Florida. A coastal air force base in Florida was badly damaged on Wednesday after experiencing the brunt of Hurricane Michael’s extreme winds and storm surge. An initial assessment of Tyndall Air Force Base, located 12 miles east of Panama City and in the direct path of Michael’s landfall, revealed “widespread catastrophic damage,” according to a Facebook post by the base on Thursday morning. Most of the facility’s personnel were ordered to evacuate on Monday, but a group stayed behind to monitor the base during the storm. The recovery team’s review of housing on site “found widespread roof damage to nearly every home,” per the Facebook post. Yesterday, officials reported downed trees and power lines, as well as some structural damage. “At this point, Tyndall residents and evacuated personnel should remain at their safe location,” Col. Brian Laidlaw, a 325th Fighter Wing commander at the base, said in statement posted to Facebook. “We are actively developing plans to reunite families and plan to provide safe passage back to base housing.” Tyndall Air Force Base has a population of more than 3,500 people, according to 2016 data. In neighboring Panama City, homes and businesses were wrecked by the storm. Greater Bay County is under a mandatory boil water notice, and a local curfew was in effect until Thursday morning. Much of the county lost power, and local officials have reported numerous impassable roads due to downed trees and other storm debris. A street in Panama City. Thousands of law enforcement officials and first responders were engaged in a vast search and rescue area across the Florida Panhandle on Thursday. Florida Gov. Rick Scott said in a press conference in Tallahassee that the search and rescue effort includes 3,500 Florida National Guards with more than 1,000 high-water vehicles, 13 helicopters, and 16 boats. More than 1,800 local law enforcement officers are on standby, while several neighboring states have donated helicopters. Scott confirmed that search and rescue teams had already moved into Panama City, Mexico Beach, Tyndall, Alligator Point, and Carrabelle, while contact has been made with Apalachicola and St George Island. Scott praised rescuers who drove through the night to reach coastal areas. "It's been a lot of work to get to everybody, but we will get to everyone... These brave men and women have already made incredible progress in getting to these areas, and they're working in unimaginable conditions," he said. "I know that what I’m going to see today is worse than anything I would have imagined." Some 2 million meals and 1 million gallons of drinking water are being deployed. Scott said that more than 400,000 homes and businesses were out of power. "So many lives have been changed forever. So many families have lost everything – businesses are gone, homes are gone, road and infrastructure along the storm's path have been destroyed. "This storm was a monster, and the damage left in its wake has yet to be fully understood. Today the top focus is search and rescue." On Thursday morning, Scott was en route to Panama City and Mexico Beach with the National Guard to assess the extent of the damage. Scott urged people not to use the roads to return to evacuated coastal areas, so as to not interfere with the search and rescue effort. There have now been at least two storm-related deaths, as authorities confirmed that an 11-year-old girl in Georgia has been killed. An 11-year-old girl died in Seminole County, Georgia, after a piece of metal struck her family’s trailer. Travis Brooks, director of Seminole County’s Emergency Management Agency, told ABC News that she died when a part of a metal carport smashed into her family’s trailer in the southeastern part of the state. Brooks told WALB that the carport was carried airborne by the wind and then crashed through the roof of the home. Search and rescue teams continue to scour through wreckage and debris in affected areas. Meanwhile, the National Hurricane Center has downgraded Michael to a tropical storm as it moves over Georgia. Maximum wind speeds have dropped to around 50 mph, but storm surge warnings remain in place for parts of North Carolina, meaning the agency believes there is still a possible threat to life. One eyewitness said the scene in Callaway, Florida, resembled a war zone. Hurricane Michael made landfall Wednesday afternoon as a Category 4 storm that brought destruction and terror as it bore down on the Florida Panhandle. With a central pressure of just 919 millibars, the storm was the third most intense hurricane to ever make landfall in the US. As the unprecedented storm struck the coast, the city of Mexico Beach was directly in its path. Among those sheltering in Mexico Beach were Patricia Mulligan and her 12-year-old daughter, Tessa Talarico, who documented the storm’s destruction on her Instagram account. The first death linked to Hurricane Michael has been confirmed in Greensboro, Florida, officials said Wednesday evening. A man in his forties was killed after a tree fell onto his house and crushed him around 5:30 p.m., Gadsden County Sheriff’s Office’s Sgt. Anglie Hightower told BuzzFeed News. Hightower said the man's wife was also injured but was expected to survive. Search and rescue crews were being deployed across the Florida Panhandle as the hurricane crossed into Georgia on Wednesday evening. Search &amp; Rescue teams are now deploying to various areas in #Florida Panhandle. Unfortunately, they expect to find loss of life. Let’s hope &amp; pray everyone they find is alive &amp; safe. Dawnn Hicks told BuzzFeed News she feared her parents, Nancy and Larry Britt, were among the dead after not evacuating from their home in Mexico Beach, a small coastal city located directly in the hurricane’s path. Gov. Rick Scott acknowledged that not everyone evacuated in advance of the storm, saying that officials would assess what they could do to better prepare people. “I'm still praying that we didn’t lose anybody,” Scott said at a press conference shortly before officials reported the first hurricane-related death. Still, the couple, who Hicks said are in their late seventies and early eighties, tried to leave on Monday night, but “they couldn’t even get off of their street,” so they stayed. Hicks last heard from her parents at 11:35 a.m. Wednesday, a couple hours before the hurricane made landfall. Exhausted and drained, people across North Carolina are readying their already hurricane-ravaged homes and communities for another powerful storm. Hurricane Michael is slated to smack the state, which is still dealing with flooding from Hurricane Florence, on Friday. North Carolina’s governor declared a state of emergency on Wednesday, warning that the “dreadful storm … poses serious risks” for thousands of residents still waiting for tarps and other resources to help patch up their gaping homes. Elsa Frongillo is still searching for a temporary place to live with her three children after Florence destroyed her home in Jacksonville, North Carolina. She described the plight of friends and neighbors, “many who have not had their roofs repaired or tarped or trees about to fall removed,” who are now nervously watching as Michael churns toward them. In Lumberton, dozens of residents swamped by Florence are still struggling to rebuild after Hurricane Matthew in 2016. Before last month’s devastating storm, people desperately tried to shore up struggling levies throughout Robeson County to try and stymie floodwaters. They gave way. Vanessa Bolin canoeing through Lumberton, North Carolina, on Sept. 22. 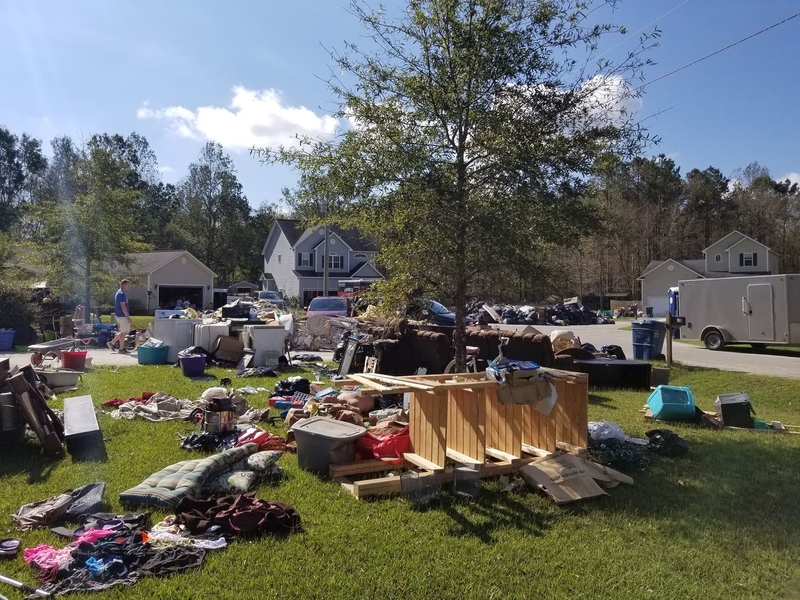 Tattered, mildewy furniture, clothes, bedding, and other belongings still lie in piles in front of mold-infected homes, Bolin and other North Carolina residents told BuzzFeed News, sparking concerns that strong winds will cause more damage because of all the loose debris. Palm trees during Hurricane Michael in Panama City Beach, Florida. Tyndall Air Force Base, located on the Florida Gulf Coast, where Hurricane Michael made its historic landfall, “has sustained extensive damage,” according to a Facebook post by the facility on Wednesday night. The military base, located 12 miles east of Panama City, was evacuated on Monday, though a crew dedicated to monitoring the base through the storm stayed behind. Evacuated personnel were warned to “make plans for an extended time away from the base” due to the damage. “The storm brought down trees and power lines. It removed roofs from buildings and caused significant structural damage,” according to the Facebook message. The condition of the base’s runway is unknown, however, and the monitoring crew announced plans to do an assessment after conditions have improved. No injuries have been reported so far. The Air Force base was in the direct path of Michael and reported a 129 mph wind gust before the weather station was lost during the storm. Extensive damage in nearby Panama City has also been reported, including multistory buildings with windows blown out, damaged gas stations, and flooded homes. At Bay Medical Sacred Heart, Panama City’s largest hospital, the hurricane has blown out windows, cracked the walls, damaged the roof, and knocked out the power. Now running on generators, the hospital has some patients who have been evacuated to safer parts of the building. As Hurricane Michael's 155 mph winds reached the Florida Panhandle, demolition followed. People tweeted photos and videos showing roofs peeling off houses, flooding, and crumbling structures. Michael is the most intense hurricane to make landfall on the Florida Panhandle, and the strongest to strike the US in the month of October, bringing catastrophic wind and storm surge to the region. Mandatory evacuations are in place in 13 counties. Florida Gov. Rick Scott previously declared a state of emergency and said the storm would bring “unimaginable devastation” to the state. Experts expect storm surge of up to 14 feet following the hurricane. The National Weather Service warned some locations may be uninhabitable for weeks or months after the devastating storm. Videos showed houses destroyed beyond repair. The strong winds and rain also battered hotels. Power lines and trees fell even in Tallahassee, more than a hundred miles away. A hotel canopy collapses onto vehicles during Hurricane Michael in Panama City Beach, Florida. Michael made landfall around 1:40 p.m. Wednesday near Mexico Beach, Florida, as a Category 4 hurricane with maximum sustained winds of 155 mph and a central pressure of 919 millibars. The landfall is one for the history books. Michael is the third most intense hurricane to ever make landfall in the US, based on central pressure, as well as the most intense tropical cyclone to make landfall in the US in the month of October. The 1935 "Labor Day" hurricane that slammed into Florida as a Category 5 hurricane with a central pressure of 892 millibars was the most intense on record, according to the National Hurricane Center. The second-ranked storm was Camille, which hit the Gulf Coast in 1969 as a Category 5 hurricane wielding a central pressure of 909 millibars. Michael has already begun damaging the Florida coast with life-threatening storm surge and extreme winds. There have been multiple reports of flooded roads, bridges, and homes. “As far as the power, pressure, the lateness of the storm, it’s going to set records,” Craig Fugate, the former FEMA head, told BuzzFeed News. The eyewall of Hurricane Michael has begun to come ashore in Florida between St. Vincent Island and Panama City, the National Hurricane Center reported. The NHC warned of "life-threatening storm surge and catastrophic winds moving onshore" as the eyewall (the most intense band of storms surrounding the eye, or center, of the storm) makes landfall. "Do not venture out into the eye when it passes!" the NHC advised, warning that weather conditions may calm temporarily in the center of the storm, but then quickly become hazardous again. A weather station at Tyndall Air Force Base reported sustained hurricane force winds gusting to 129 mph as the center of the storm roars ashore. Hurricane Michael is already impacting Panama City Beach. Hurricane Michael continued to strengthen just ahead of making landfall along the Florida coast, with maximum sustained winds around 150 miles per hour, according to the National Hurricane Center. "This is a worst case scenario for the Florida Panhandle!!" the National Weather Service warned in a tweet. Weather officials are telling those in the path of the storm to take cover and treat the extreme winds as if a tornado were approaching. Michael has already pounded the Florida coast for hours with strong winds, heavy rain, and storm surge. Preliminary observations in Apalachicola, Florida, suggest the local storm surge has reached a new record of 6.71 feet. Officials predict the surge levels could reach up to 14 feet there. The damage reports have already started to come in, from collapsed gas stations to flooded coastal homes. As of Tuesday night, at least 4,000 people stayed in Red Cross and other shelters in Florida, according to the Red Cross. There's also been a wave of facility evacuations in the path of storm, including six correctional facilities and more than a dozen assisted living and adult care sites. Florida governor Rick Scott urged residents Wednesday morning to take the necessary precautions to protect themselves during the storm, which will bring “unimaginable devastation” to the state. “This is the worst storm the Florida Panhandle has seen in over 100 years,” he said. “The worst thing you can do now is leave and put yourself and your family in danger,” he said. The storm surge will be 9–13 feet, the governor said, and could easily rise over the roofs of houses. The governor said that as soon as the storm passes, rescue efforts will begin. He said there will be more than 1,000 search and rescue personnel deployed to help as well as dozens of crews staged to clear roads to aid in the rescue operations. Hurricane Michael is expected to make landfall Wednesday morning on the Florida Panhandle, as a Category 4 storm, causing a catastrophic storm surge and winds over 130 mph. Michael could be the most powerful hurricane to strike Florida's Panhandle, according to the Weather Channel. Evacuation orders are in place for parts of at least 18 counties, the governor’s office said. “In our records, we’ve never seen a Category 4 hurricane impact this area,” Tim Oram, a meteorologist at the National Hurricane Center, told BuzzFeed News. The strongest that has been seen was about a Category 3 storm a couple times in the 1800s and around 1917, Oram added. As of Wednesday morning, Michael had maximum sustained winds of 140 mph and is expected to grow stronger. At 7 a.m. 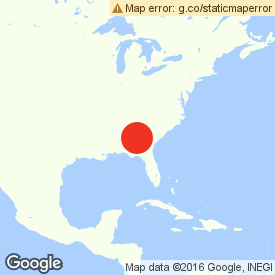 ET Wednesday, the storm’s center was about 105 miles southwest of Panama City, Florida. Florida’s northern and northwestern coasts are highly susceptible to dangerous storm surge due to the shape of the ocean floor and the curve of the coastlines there. The area between Florida’s Indian Pass and Crystal River, for example, could see 9 to 13 feet of water surging above normally dry land. The National Weather Service in Tallahassee has been urging residents to evacuate. One of Michael’s “biggest hazards is going to be storm surge,” David Zelinsky, a hurricane specialist at the National Hurricane Center, told BuzzFeed News. Hurricane Michael is intensifying in the Caribbean, and is now forecast to strike the Florida Panhandle as a Category 3 hurricane sometime on Wednesday. Check here for a comprehensive set of maps showing predicted wind, rain, and floods expected from Hurricane Michael. The waters have already begun to rise along the Florida coast thanks to Hurricane Michael, and the storm surge is expected to quickly become dangerous and damaging. The map above shows the areas that may be worst affected, according to the latest forecasts from the National Hurricane Center. When a hurricane hits land, sea level can suddenly rise at the coast as atmospheric pressure drops and water is pushed toward land by the storm’s winds. These surges can be major killers, and are most risky when they coincide with a high tide.